Saturday, May 28, from 10 a.m. to 3 p.m. – It’s Family Fun Day at La Pintoresca Park and Branch Library! Join us for entertainment, food, arts and crafts, skate park competition and much more. Monday, May 30 -- City of Pasadena administrative offices, libraries, community centers and health clinics will be closed for the Memorial Day holiday. Trash and recycling pickup will be on the regular schedule this week. Monday, May 30, at 11:45 a.m. – A wreath will be placed at the Pasadena Vietnam Memorial during a public ceremony at Memorial Park (Raymond Avenue between Holly and Walnut) organized by the Pasadena Chapter of the Vietnam Veterans Association. Children will sing the National Anthem, and many veterans will be in attendance. The ceremony will be preceded by a flyover at 10:45 a.m. (626) 795-8141. 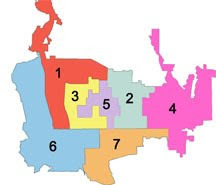 Tuesday, May 31 – Interested in serving on the Redistricting Task Force? Today’s the deadline for applications. 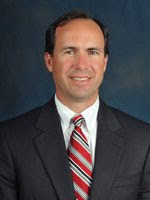 Tuesday, May 31, at 6:30 p.m. – City Manager Michael J. Beck is asking for your input on the ideal qualities of Pasadena’s next director of public works. Thursday, June 2, at 6 p.m. – Attend the last in a series of four community workshops where you’ll share ideas for the design of a proposed park in the Playhouse District. Saturday, June 4, from 11 a.m. to 2 p.m. – Bring your family and friends to an open house at the Pasadena Police Department Heliport! See a more comprehensive schedule of events for the same time period, including city council and commission meetings, here. 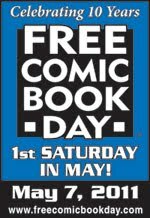 See more community events (and add your own) here. Many thanks to Kevin Joyce for the photo from the 2010 heliport open house. Update (5/26, 11:20 a.m.): I'm giving Sid a prize just for all the wonderful work he does as Pasadena's favorite and most renowned historic photo archivist! Sid Gally got it right, but he's a leading archivist of historic photos in Pasadena, so he's disqualified from winning the prize. Nice try though, Sid! 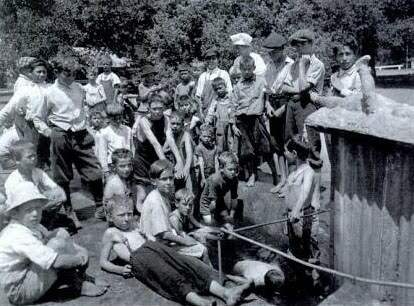 In the circa 1924 photo above, boys ages 6 to 14 with medical issues such as low weight, chronic fatigue, anemia and malnourishment soak up the sunshine under the supervision of a nurse at the Pasadena Preventorium built on about 10 acres that overlooked the Arroyo Seco. Established in 1922 and one of several in the nation, it was designed to help build up the boys' strength through exercise, rest and sunshine while keeping them in isolation to help prevent the highly contagious disease from invading their bodies. 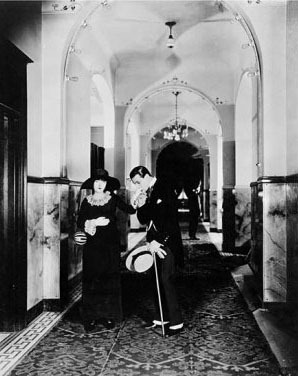 Several partner agencies were involved in the establishment and management of the site, including the city, the school district and the Pasadena Tuberculosis Society. In addition to providing as much care and activity as possible to help prevent tuberculosis in the children, there was an on-site school to ensure that their daily lessons would continue. Monetary donations from the community helped sustain many of the fiscal needs. Prior and into the 1920s and 1930s, many children in the U.S. died of tuberculosis, so it was considered prudent to establish these preventoriums to help ensure they would grow up to be healthy adults. 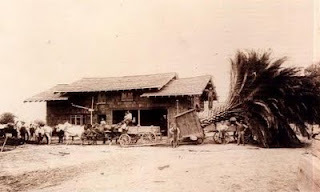 The preventorium accepted only boys in its early years; female children were welcomed after a capital campaign for the purchase of a new site for a girls' wing. The fact that sun bathing is an important part of the children's routine at the schools makes it desirable to separate the boys' and girls' divisions, according to Mrs. J. Ross Charles, president of the council. Donations to the preventorium were also important for the sponsorship of frail children from low-income families. The same was the case with summer camps for pre-tubercular boys. Do you know the Pasadena Public Health Department maintains a tuberculosis clinic to this day? Learn more here. 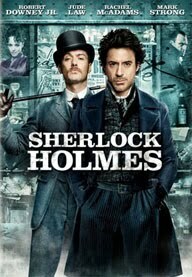 Wednesday, May 11, at 1 p.m. – This week’s film in the Donald R. Wright Auditorium at Pasadena Central Library is “Sherlock Holmes” (2009, PG-13) starring Robert Downey Jr. and Jude Law in the tale of Sir Arthur Conan’s Doyle’s detective and his stalwart sidekick Watson in a battle of brains and brawn against a nemesis who threatens all of England. Thursday, May 12, at 7 p.m. – “Helen of Pasadena” author Lian Dolan will discuss her popular novel in the Donald R. Wright Auditorium at Pasadena Central Library. Bring yours for her to sign! Saturday, May 14, from 10 a.m. to 12:30 p.m. – Share your ideas for a proposed park site at the corner of Union Street and El Molino Avenue in the Playhouse District. Saturday, May 14, from 10 a.m. to 4 p.m. – It’s Fire Service Day, complete with demonstrations (flames! jaws of life! ), open houses, food and lots of big, red fire engines! 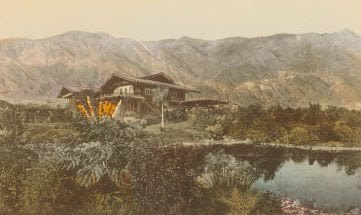 Saturday, May 14, from 10 a.m. to 6 p.m. – Learn about sustainable planting, gardening and landscape design for Southern California’s climate at Linda Vista Branch Library, presented by experts from the Theodore Payne Foundation and Los Angeles County Arboretum. Sunday, May 15 -- Today is the Pasadena Marathon! We’ve set up a special web page with regularly updated info on road closures, transit detours, parking restrictions, maps and more. All events listed above are free. See a more comprehensive schedule of events for the same time period, including commission meetings and city council meetings, here. 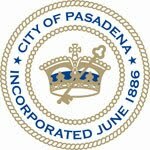 See even more community events (and add your own) at www.cityofpasadena.net/calendar. In the 1907 photo above, workers near completion of the garage at retired Michigan lumber magnate Robert R. Blacker's estate while landscaping materials are brought in. 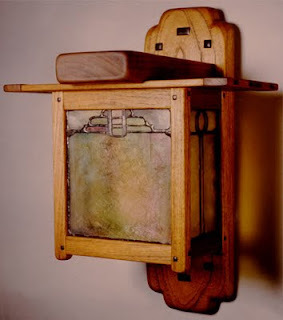 Teak, mahogany and ebony were used. Total cost of the project was $100,000 -- a whopping amount of money at that time. As Mr. Blacker, the owner, is an old lumber man, he has taken great pride in having the best material obtainable for the house. Days and weeks have been spent in securing timbers which would suit his taste. The exterior works consists of a great deal of detail work obtained by cross timber work and wherever there is an exposed beam this is absolutely perfect, without a knot or chuck. Hand-wrought iron fastenings hold these timbers in place and will be allowed to rust to get the desired effect. Hammered copper sheets, formed into gutters and ducts, lead the rain water to the cement drains and are tarnishing to an aged look. The E.O. Nay Company got the plumbing contract for the buildings and grounds. 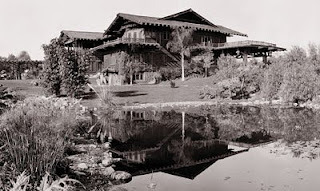 For many years the Blacker House, with its seven-acre grounds, gardens and ponds, was the crown jewel of the Oak Knoll subdivision in the early 20th century. 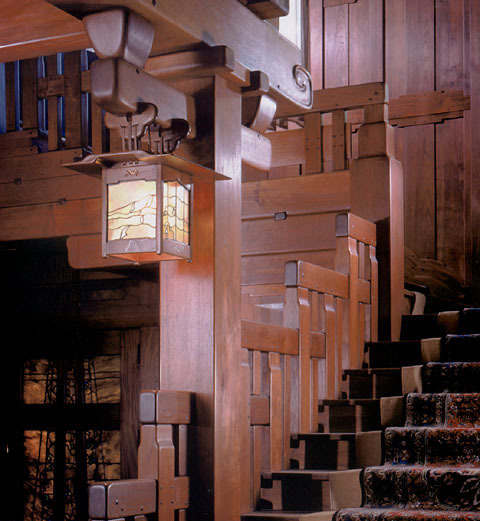 As was the case with the Gamble House, Greene & Greene designed everything from the exterior to the furniture and fixtures. Pasadena citizens, including Mr. Makinson*, loudly declared their outrage, and with the support of Pasadena Heritage, a preservation group, the city passed an emergency ordinance that slowed further removal of the pieces. Citizens guarded the house in cars parked out front. Enter Harvey and Ellen Knell. They bought the Blacker House in 1994 and immediately set their minds to restoring it to the best extent possible. They worked with Mackinson, master craftsman James Ipekjian, Hamm Glass Studios and other specialists who replicated the sold-off fixtures and restored the house inside and out. After four years of restoration, a benefit dinner hosted by actor Brad Pitt celebrated the completion of the project. The Blacker House had finally regained its state of grace intended by the Greene brothers. 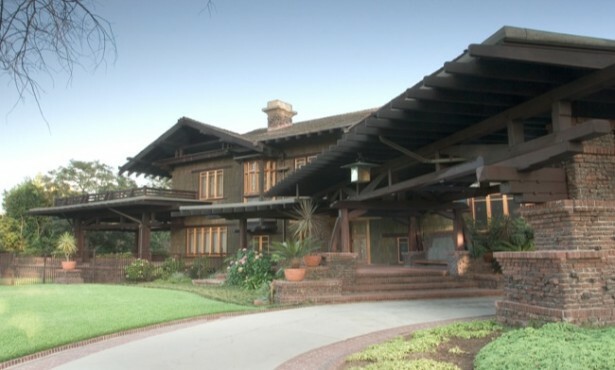 It was listed in the National Register of Historic Places in 1986 and is an important component of the annual Craftsman Weekend organized every October by Pasadena Heritage. I could get into much more detail and history, but I'll leave it you to learn about. The Gamble House has a couple of web pages devoted to the Blacker House here. "Greene & Greene: The Blacker House" is an excellent book if you want to learn even more (way more!) about it. You can also drive by the Blacker House -- the Knells wouldn't mind. 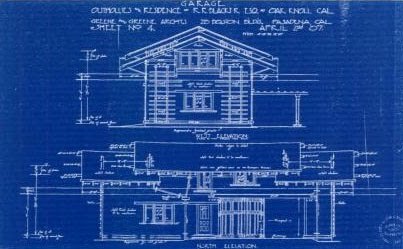 It's at 1177 Hillcrest Ave.
* Randell Mackinson of Pasadena is a historic restoration architect with a specialty in Greene & Greene. Many thanks to Pasadena Public Library, Randell Mackinson, the Gamble House, Hamm Glass Studios and Hometown Pasadena. City Manager Michael Beck presented the outgoing District 4 councilman with his very own Steve Haderlein Field, made with loving hands by Michael and his children. Monday was a bittersweet evening, full of fond farewells and new beginnings as the Pasadena City Council reorganized. Jane Haderlein and their daughters offered touching testimonials about their great husband and father, and the impact of his dedicated public service on their lives. The meeting was adjourned and civilian Steve Haderlein joined his family in the audience. Next the mayor called the meeting to order again, and it was time for the swearing in of newly elected and re-elected officials by City Clerk Mark Jomsky. From left are District 6 Councilman Steve Madison, District 4 Councilman Gene Masuda, District 2 Councilwoman Margaret McAustin, District 1 Councilwoman Jacque Robinson and Mayor Bogaard. Mayor Bogaard presented Victor Gordo with a commemorative clock in appreciation of his two years of service as vice mayor. The final order of business was the election of a new vice mayor. Congratulations to Margaret McAustin, who will lead council meetings and perform other duties whenever Mayor Bogaard is not available. Photos by the mighty Zack Stromberg of the Public Affairs Office. 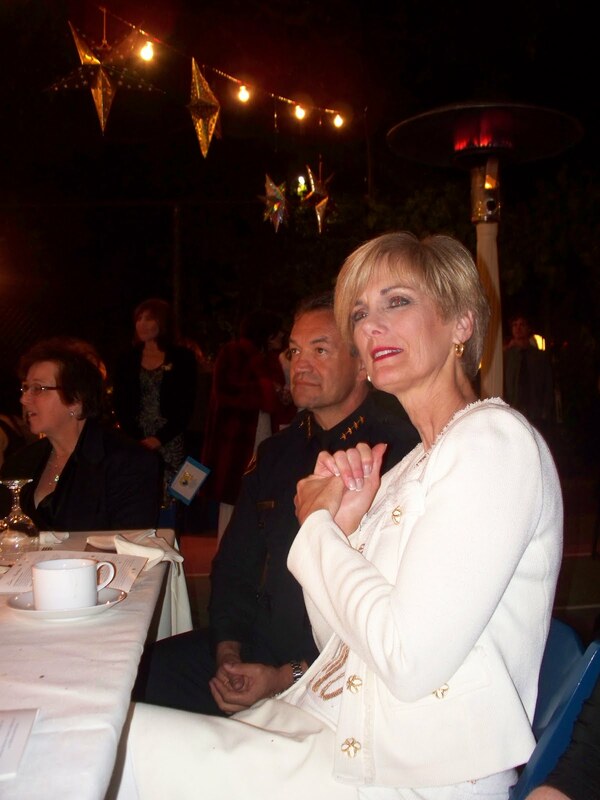 ...and on Saturday evening we were at the same table at Villa Esperanza's Blue & White at Night benefit gala. I posted more photos of both events on Facebook.